In the middle of the Navajo Reservation in northwest Arizona, Chinle is a remote but atmospheric town, serving as the gateway to Canyon De Chelly National Monument, amongst the top attractions in the state. Chinle is reached by US 191, about half way between Chambers on I-40 and Mexican Water on US 163, one of the few significant settlements on this 149 mile stretch of desert highway. Facilities along US 191 include the Tseyi Shopping Center, with Basha's supermarket, but most shops, and lodging, are a short distance east, along Route 7, which leads to the national monument entrance. The horizon is flat in most directions, interrupted only by a few distant hills, and there is no sign of Canyon De Chelly at first, but the low cliffs enclosing Chinle Wash soon rise several hundred feet, and the land becomes partly wooded. The next nearest National Park Service property is Hubbell Trading Post National Historic Site, 38 miles south. In the heart of the Navajo Reservation, Chinle acts as the gateway to Canyon de Chelly National Monument, and the nearest hotel to the monument - one of only two chain hotels in town - is Holiday Inn Canyon de Chelly, at Garcia Trading Post, less than one mile west of the entrance along Indian Route 7. The 108 room hotel shares a complex with several restaurants and is within walking distance of various shops and other amenities in Chinle. Interiors are bright and modern, the staff helpful, and the hotel has all the expected amenities, including an outdoor heated pool, exercise room, gift shop, and dining/room service available from the adjacent Garcia's Restaurant. 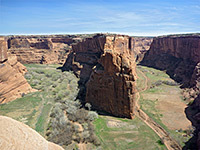 Tours of Canyon de Chelly can be arranged at the gift shop. Two miles west of the entrance to Canyon de Chelly National Monument, at 100 Main Street, the Best Western hotel in Chinle is a clean, friendly place to stay, within walking distance of the small number of shops & restaurants in town - located one block east of US 191 along Indian Route 7. The inn has a distinctive Southwestern style, and the Native American culture of the area is reflected in both the decor and cuisine of the hotel's Junction Restaurant, open for breakfast (not complimentary), lunch & dinner. Best Western Canyon de Chelly Inn was partially renovated in 2007, and also features an indoor pool, hot tub, steam room, guest laundry, and a gift shop selling a wide selection of Navajo jewelry.